Update (06/26/2012): Part two of the interview is now online. Thanks to RushFanForever for the link. MusicRadar has just posted the first of a two-part lengthy interview/discussion with Geddy Lee and Smashing Pumpkin's and Rush fan Billy Corgan. The discussion centers around "...the merits - and challenges - of the album as art form..."
Significantly, both albums break the mold for Music Business 101 in 2012 in that they're concept pieces – Clockwork Angels is a self-contained narrative, while Oceania is part of the Pumpkins' adventurous Teargarden By Kaleidyscope project. 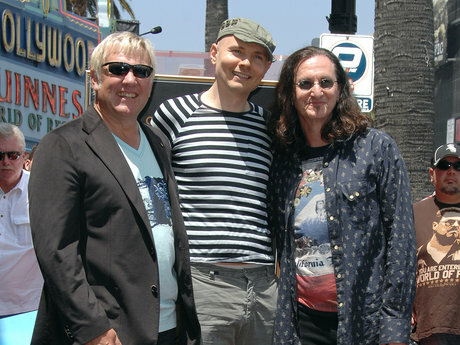 That both groups, Rush and The Smashing Pumpkins, have hit creative highs while rejecting the notion that 'the hit single is king' was the starting point for a discussion MusicRadar recently had with Lee and Corgan in which the two talked about how they navigate through the murky waters of the music business and rise to the challenges of what Corgan calls the "iPod era." You've both released albums that can be appreciated from beginning to end – that right there is a concept. Do you feel as if you're somehow attempting to revitalize a format that others are discarding? Or is it more a way to revitalize what the band is doing? Geddy Lee: "I don't think we look at it as revitalizing a thing outside of the band. To me, it's just dependent on what ideas you have cooking and what you want to accomplish – for us, between the three of us. It seemed, at this stage, we were chomping at the bit to do something a bit more ambitious and to see if we could stretch out and tell a story in a longer form. We didn't set out to do an album that was 66 minutes long. [laughs] That's kind of the way it ended up.